You're likely reading this post because you've decided that Twitter should not be the permanent public record for your passing thoughts, jokes, and transient opinions. Be it because of a new professional opportunity, the changing social climate–what used to be funny may now be seen as offensive,– because you’re growing as a person and your opinions have changed from what they used to be years ago; or simply because the sight of thousands of tweets on your profile page makes you feel overwhelmed! Now you want to regain more privacy on your Twitter account and do some cleanup. However, you also want to keep your followers and the community you’ve been part of for years. So what to do? 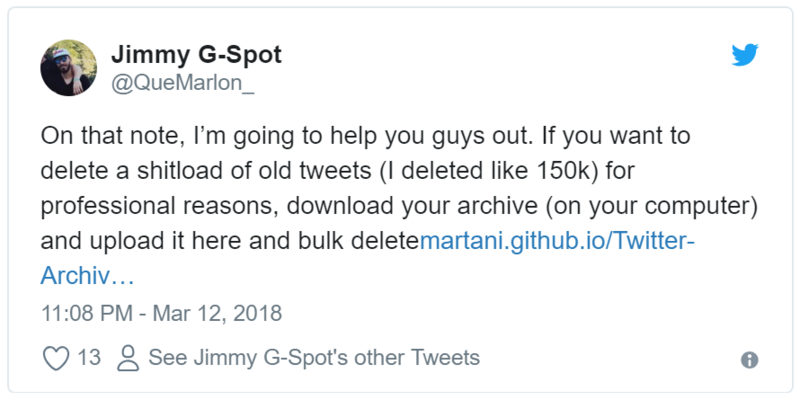 Twitter Archive Eraser was built to solve this exact problem: helping you clean up your Twitter account by automatically deleting tweets, favorites, and direct messages (DMs), without the need to delete your account and losing your followers. We built Twitter Archive Eraser to be very user friendly: you can search and select thousands of tweets to delete or keep with a few clicks. Being convenient and user friendly did not limit us from making the app very efficient and exceptionally performant as we will detail below. Twitter Archive Eraser is battle tested: it has been downloaded more than 500K times and helped users delete +3 Billion tweets so far. How to delete Direct Messages (DMs) by date range, from a specific sender, by keywords etc. How to delete Favorites (Likes) by date range, from a specific user, by keywords etc. How to view, browse and search all the Favorites (Likes) or DMs on my account. Good news 🎉! You can do all of the above and more in a few clicks with Twitter Archive Eraser. But also, easily finding, ranking, and keeping your best tweets: for example, that tweet that got hundreds of favorites/Retweets a few years ago. Being able to search by keyword, date range etc. is not enough as you need to remember the exact time or text of your successful tweets. Twitter Archive Eraser’s “Smart Analysis” feature filters and fetches your best tweets in one click! Twitter Archive Eraser Smart Analysis fetching best tweets in one click. Search on Twitter for testimony if all the users who love Twitter Archive Eraser. Click on “Sign In” and you’ll be redirected to twitter.com website where you authorize the app. This grants the app the permissions to delete tweets, favorites, and DMs on your behalf. Twitter will give you a temporary PIN number that you enter back in Twitter Archive Eraser. Notice that Twitter Archive Eraser does not ask for (nor need) your password. This is a security best practice as your password is safeguarded exclusively by Twitter. Once you’re authenticated, you’ll see a greeting with your Twitter user name. Choose what you want to delete: tweets, favorites, or DMs and proceed to the next step. In this step, you load your Twitter archive (zip file) into Twitter Archive Eraser. Download your Twitter archive if you haven’t done so already. Deleting tweets? download the archive under “setting/account” (see instructions). This archive is lightweight and is recommended for deleting tweets. Deleting tweets, favorites or DMs? download the archive under “settings/your_twitter_data” (see instructions). Twitter Archive Eraser loading +105K tweets at once. Once you load your archive, Twitter Archive Eraser will extract all tweets, favorites, or direct messages depending on what you’re deleting. Your’re then presented with a list of all your tweets grouped by year and month. Select the time ranges you’re interested in deleting tweets from and click “Next” to proceed to the next step. Deleting ~75K tweets in one shot in less than 30 minutes. This is the step where the magic happens. 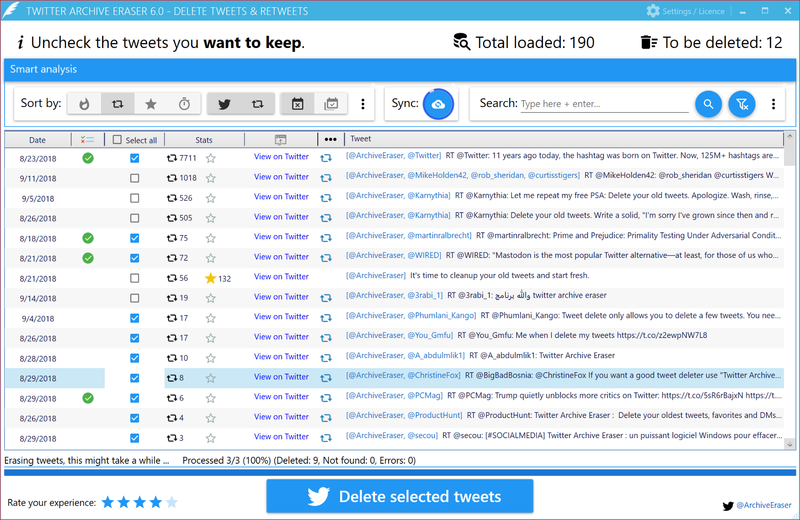 We will briefly detail the most useful features you can use to select which tweets to delete and which to keep. Twitter Archive Eraser showcase: search, ranking, sync and selecting tweets to delete. Search by keywords, users, mentions, Regular Expressions. By default, both tweets and Retweets are displayed in the deletion window. Sometimes you’d like to only work on tweets or Retweets (e.g. search, sort etc.) The “tweets type” buttons allow you to select which type of tweets to display. Once a type is selected, all the other functions only use this type: for example, searching while only viewing Retweets will not return tweets that match your search. Twitter Archive Eraser: View only Tweets, Retweets or both. 3. ✅ Find your best performing tweets, in a single click! This is the ideal feature for an effective Twitter account cleanup in our opinion. You’ve decided you can let go of tweets from several years ago except those that had a great amount of Retweets and Likes. 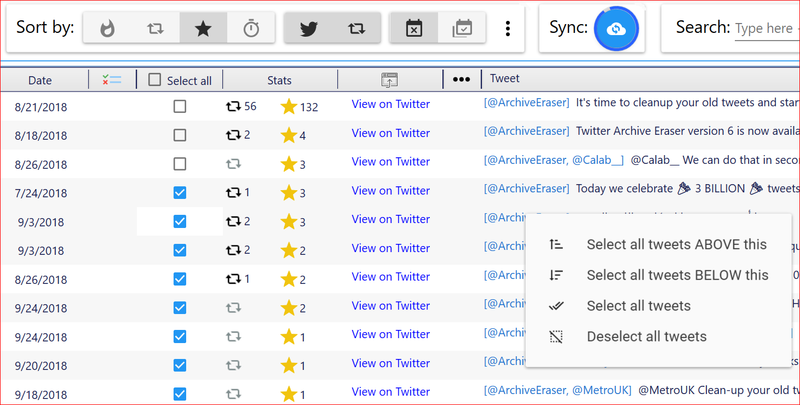 As we promised, with one click, Twitter Archive Eraser can find your best performing tweets and bring them to the top of your tweets view. Twitter Archive Eraser Smart Analysis. Pro tip: what’s the hotness metric? Hotness combines the amount of Retweets and Likes so that a tweet with 10 Retweets and 0 likes does not rank better than a tweet with 9 Retweets and 1000 Likes. When you first rank your best tweets first, Twitter Archive Eraser will show them across all the time ranges you selected in Step 2. If you want to see the best tweets within each month, click on the “calendar” button in the “Smart Analysis” pane and you’ll be able to toggle between a per month/across months best tweets. Pro tip: I have too many best tweets, so I want to see the worst performing ones first. We hear you! just click the vertical ellipsis “⋮ ” button then flip the sorting from Descending to Ascending and voila! least performing tweets first. Alright, so you’ve got your best tweets; But you have downloaded your archive over a month ago and some of the tweets have gone pretty popular since; However, they are not reflecting in Twitter Archive Eraser! You are almost done: you got best tweets to keep, but now you need to select those to delete. However, you realize that for a given month, you have a few best tweets to keep but maybe hundreds or thousands that you’d want to delete. You obviously don’t want to select them one by one. In the same spirit of our philosophy of a convenient yet effective and powerful UI, you also can achieve this in a few clicks. Her’s how: once you sort your best tweets to the top, select the last best tweet that you want to keep, right click and choose “Deselect all tweets.” Right click again and choose “Select all tweets below this.” This will allow you to select, in one shot, thousands of tweets which are not as popular. Twitter Archive Eraser: keep best tweets and select everything else in once click. Sit back and relax while you witness the screen smoothly scrolling as thousands of your tweets get deleted in real time and in a matter of minutes. We promise, it feels liberating. Pro tip: leave us feedback, from within the app, about what you like and what we can improve while your tweets get deleted. Twitter Archive Eraser: delete tweets.